Lower back pain (LBP) and lumbar radiculopathy pose major medical and social problems that create a significant economic burden on society. ,,, LBP has an estimated lifetime prevalence of 60-90% , where more than one-tenth of the population may become disabled. Moreover, the prevalence of lumbar radiculopathy ranges between 3% and 5%. Inadequate recovery rates and dissatisfaction create challenges for health care professionals. Lumbar spinal stenosis is a cause of LBP and lumbar radiculopathy. The condition results from degeneration of the intervertebral discs and facet joints, leading to constriction of the spinal canal and neural foramina. Compare values with established literature metrics. In the period between 2009 and 2012, we obtained informed consent for and enrolled 17 patients (10 asymptomatic patients, 7 symptomatic patients) for upright MRI imaging [Table 1]. There were 10 males and 7 females, with a mean age 29.6 ± 7.9 years. Height and weight were obtained at the time of consent. Symptomatic patients had complaints of either lumbar back pain and/or radiculopathy. The study excluded patients who had a spinal deformity, an underlying pathology, or prior spinal injury or surgery. A 0.6T upright MRI scanner (Fonar Corporation, Melville, NY, USA) imaged the lumbar spine with patients in the seated position. Five oblique sagittal images were obtained through the right and left intervertebral foramina from L2-L3 through L5-S1. Axial scout scans were used to align images parallel to the pedicle prior to image acquisition. Three-millimeter T2 scans were spaced at 3.5-mm intervals. 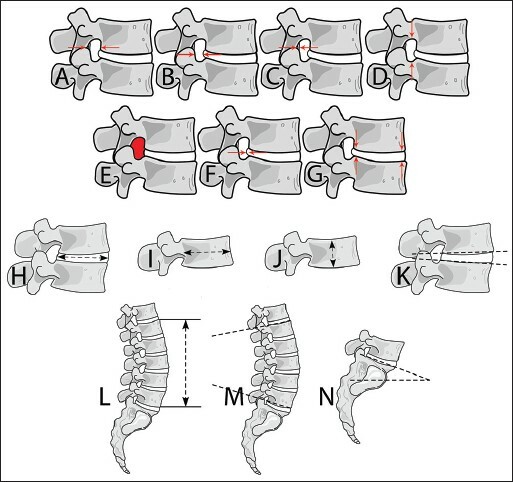 OsiriX image-processing software (Pixmeo, Bernex, Switzerland) was used to analyze magnetic resonance (MR) images to measure parameters pertaining to the intervertebral foramen, intervertebral disc, vertebral body, and lumbar spine alignment as indicated below [Figure 1]. This is defined as the area bounded superiorly and inferiorly by adjacent pedicles, anteriorly by the posterior longitudinal ligament, and posteriorly by the ligamentum flavum. This is defined as the AP width at the rostrocaudal midpoint of the intervertebral disc. This is defined as the maximum AP width of the foramen. This is defined as the maximum distance between the inferior aspect of the pedicle of the superior vertebra and the superior aspect of the pedicle of the inferior vertebra. This is defined as the AP width of the ligament, and is measured from the midpoint between the attachments of the posterior fibers to the superior facet of the inferior vertebra to the midpoint between the attachments of the anterior fibers to the inferior facet of the superior vertebra. This is defined as the perpendicular distance measured from a line drawn between the most posterior edge of adjacent ring apophyses to the most posterior point on the posterior margin of the bulging intervertebral disc. This is defined as the intervertebral disc height in the anterior and posterior aspects of the disc. Anterior and posterior disc heights were measured as the distance from the most anterior/posterior-inferior corner of the superior vertebrae to the most anterior/posterior-superior corner of the inferior vertebrae. This is defined as the AP width of the intervertebral disc, measured in the midsagittal plane. Rostrocaudal height of the vertebral body was measured in the midsagittal plane. AP width of the vertebral body was measured in the midsagittal plane. This is defined as the horizontal distance from the anterior-superior corner of L1 and the anterior-inferior corner of L5 at the midsagittal section. This is defined as the angle that subtends the upper endplate of L1 and the lower endplate of L5. This is defined as the angle along the superior endplate of S1 relative to the horizontal plane. This is defined as the angle that subtends the inferior endplate of the superior vertebra and the superior endplate of the inferior vertebra, encompassing the disc space. Measurements were initially completed by a single author (H.N.). Subsequently, five volunteers were randomly selected and measurements were repeated by the same author (H.N.) as well as by a second author (N.D.). All the measurements were grouped together by the observer, where interobserver and intraobserver correlation coefficients were calculated accordingly. Subsequently, each measurement was statistically compared based on the spinal level and volunteer group (asymptomatic versus symptomatic) using two-factor analysis of variance (ANOVA) with a significance level of P < 0.05. Bonferroni post hoc analysis was used to determine significant differences between individual spinal levels. Intraobserver correlation coefficient was 0.995. Interobserver correlation coefficient was 0.957. [Table 2] summarizes the results regarding intervertebral foramen dimensions. Foramen height was significantly dependent (P < 0.05) on the spinal level but was not different for symptomatic patients compared to asymptomatic controls. Post hoc analysis revealed that foramen height across all volunteers was significantly smaller (P < 0.05) at the L4-L5 and L5-S1 spinal levels than at the L1-L4 spinal levels. Foramen width was significantly dependent (P < 0.05) upon spinal level and volunteer group. Width was smallest at the L1-L2 spinal level, increased to L3-L4, then decreased to L5-S1. Post hoc analysis revealed that width at the L3-L4 level was significantly greater than L1-L2. Foramen width was an average of 16% greater in symptomatic compared to asymptomatic patients across all investigated spinal levels. Foramen mid-disc width was not significantly dependent on either the spinal level or volunteer group. However, given the larger maximum foramen width dimension in symptomatic patients across all levels, mid-disc width was scaled to maximum foramen width by dividing mid-disc width by foramen width. That metric was significantly dependent (P < 0.05) on both the spinal level and volunteer group. Mid-disc width was approximately 50% of the maximum disc width at the L3-L4 and L4-L5 spinal levels and approximately 70% at the L1-L2 and L5-S1 levels. Across all levels, foramen mid-disc width was an average of 63% of the maximum width for asymptomatic volunteers and only 56% for symptomatic patients. Foramen cross-sectional area (CSA) was significantly dependent (P < 0.05) on the spinal level and volunteer group. CSA was generally smaller in symptomatic patients compared to asymptomatic volunteers, particularly at the L4-L5 and L5-S1 spinal levels where the area was 16% and 20% smaller, respectively. Thickness of the ligamentum flavum was significantly dependent (P < 0.05) on the spinal level and volunteer group. Thickness of ligamentum flavum (TLF) generally increased from the cranial to caudal spinal levels, with post hoc analysis revealing that the L4-L5 and L5-S1 spinal levels had significantly greater thickness than the L1-L2 spinal level. Thickness was also 44% greater in symptomatic patients compared to asymptomatic patients. These group-based differences were distributed approximately evenly across the five investigated spinal levels. Intervertebral disc bulge was significantly dependent (P < 0.05) on the spinal level and volunteer group. The magnitude of disc bulge was significantly greater (P < 0.05) in symptomatic patients and increased from the cranial to caudal levels, with disc bulge at L4-L5 and L5-S1 considerably greater than all other investigated levels. The magnitude of disc bulge for asymptomatic controls was smaller and did not demonstrate clear level-by-level trends, being smallest at L1-L2 and L5-S1 and largest at L4-L5. The greatest difference in disc bulge for symptomatic patients compared to asymptomatic controls was evident at L4-L5 (+50%) and L5-S1 (+111%). Anterior and posterior intervertebral disc heights were significantly dependent on the spinal level (P < 0.05) but not the volunteer group. Anterior disc height was marginally greater in the symptomatic patient group and generally increased from L1-L2 through L4-L5 with decreased height at L5-S1. Posterior disc height was generally smaller than the anterior disc height. That difference was exaggerated at the caudal levels with posterior disc height at the upper lumbar spinal levels being approximately 75% of the anterior disc height. However, posterior disc height was only 60% of the anterior disc height at the caudal spinal levels, which reflect the greater degree of segmental curvature at those levels. Intervertebral disc width was significantly dependent on the volunteer group (P < 0.05) but not the spinal level. Across all spinal levels, disc width was 14% greater in the symptomatic group (38.2 ± 4.1 mm) compared to the asymptomatic volunteers (33.5 ± 3.2 mm), and significantly greater at the L2-L3 through L5-S1 levels. Vertebral body height was not different between the volunteer groups or spinal levels. However, vertebral body width was significantly greater (P < 0.05) in symptomatic patients than asymptomatic volunteers although not different between the spinal levels. Specifically, across all spinal levels, vertebral body width was 10% greater in symptomatic patients and significantly greater at the L3 and L5 spinal levels. [Table 3] summarizes the results regarding lumbar alignment parameters. Lumbar spine lordotic angle was not significantly different between the volunteer groups although symptomatic patients demonstrated 18% decreased curvature. Lumbosacral angle was also not significantly different between the volunteer groups. However, symptomatic patients demonstrated 22% decreased angle. Symptomatic patients generally had a greater lumbar spine length although the difference was not statically significant. Wedge angle was significantly dependent (P < 0.05) on the spinal level but not significantly different between the volunteer groups. Wedge angle increased from the cranial to caudal levels for asymptomatic volunteers and was significantly lower at L1-L2 compared to L3-S1 spinal levels. Wedge angle at L2-L3 for asymptomatic volunteers was also significantly lower than L5-S1. Similarly, wedge angle for symptomatic patients also generally increased from the cranial to caudal levels, with the wedge angle at L1-L2 significantly lower than at the L5-S1 spinal level. Initial upright MRI studies on the foramen were qualitative. Wildermuth et al. and Gilbert et al. noted a tendency toward higher grades of stenosis in the upright position compared to the supine position in symptomatic patients. However, Weishaupt et al. observed this relationship with their group of symptomatic patients only with upright extension while upright flexion resulted in lower grades of foraminal stenosis. Mauch et al. indicated that stenosis occurred more frequently at the lower levels of the lumbar spine in their cohort of asymptomatic athletes. Overall, quantitative studies have reported similar patterns. Schmid et al.,  while studying asymptomatic patients, noted that upright flexion had the largest overall foraminal CSA followed by upright neutral position; upright extension and supine extension had the narrowest CSA. Flexion movement increased CSA more at the L4-5 level than at the L5-S1 level; with extension, the size of the intervertebral foramen decreased more at the L4-5 level than at the L5-S1 level. These prior quantitative studies did not compare the upright parameters between asymptomatic and symptomatic patients, as our study did with volunteers in the upright position. Absolute foramen dimensions were not indicative of pain symptoms, with foramen height, width, and mid-disc width dimensions generally equal to or larger than the same dimensions in asymptomatic volunteers. However, taller stature in the symptomatic group indicated greater body size, which was reflected by increase in lumbar spine length and vertebral body and intervertebral disc width. Therefore, normalizing mid-disc foramen width to maximum foramen width may provide a better estimate of stenotic changes associated with posterolateral disc bulge. Indeed, the normalized foramen width at the mid-disc height provided evidence of foraminal stenosis, with mid-disc width accounting for only 56% of maximum foramen width in symptomatic patients and over 63% in asymptomatic volunteers. 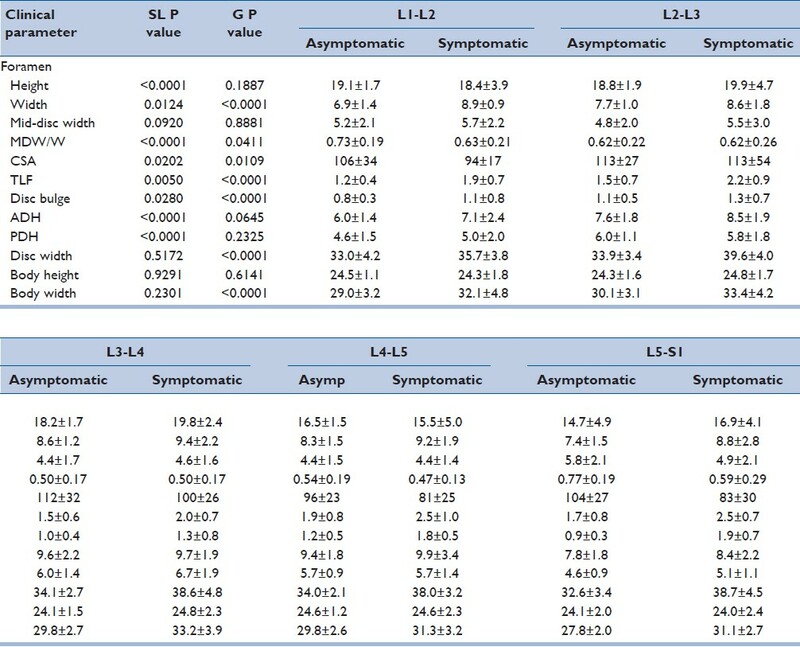 Moreover, CSA was generally smaller in symptomatic patients compared to asymptomatic patients, particularly at the L4-L5 and L5-S1 spinal levels. These findings provide some evidence of stenotic etiology due to narrow bony anatomy for pain symptoms in this population. Our results appear to be in line with Mauch et al. and Schmid et al. where the lower levels of the lumbar spine exhibited a tendency for foraminal stenosis. Our study did not directly evaluate upright extension/flexion or supine position. Schmid et al. noted that the thickness of the ligamentum flavum (TLF) was significantly thinner with upright flexion compared to both extension positions (supine extension and upright extension); moreover, the TLF was also significantly thinner with upright neutral compared to both extension positions. The difference between supine extension and upright extension was less clear while there was no statistical significance between upright flexion and upright neutral. This appeared reasonable since the ligamentum flavum buckles in the extended position. Similarly, Fujiwara et al. also noted that the TLF decreases with flexion. Our study demonstrated that TLF was statistically larger along all disc space levels in the symptomatic group. This observation supports the idea that ligamentum flavum hypertrophy may play a role in causing LBP or radicular complaints. Several studies have evaluated disc parameters with upright MRI. Ferreiro Perez et al. compared the diagnosis of posterior disc herniation on upright MRI versus supine MRI in symptomatic patients; the group noted that the latter protocol underestimated the disc pathology. Gilbert et al. noted similar findings, adding that the discrepancy was most prominent at L5-S1 followed by L4-L5 and L3-L4. On the other hand, Zamani et al. noted no difference in the posterior disc bulge from supine to upright neutral. In addition, disc height may significantly reduce after activity  and with increasing axial loads. In our study, the disc bulge was significantly larger at L4/5 and L5/S1 in the symptomatic group. Overall, disc bulge was 48% greater in symptomatic patients compared to asymptomatic controls while disc height had no significant findings. The findings were similar to those of Gilbert et al.,  and suggests that disc pathology is more evident in the lower lumbar levels based on upright MRI and contribute to soft tissue findings for foraminal stenosis. Lumbar alignment has been explored with upright MRI but the results have been conflicting. Lumbar lordosis have been shown to increase  or decrease  from supine to standing positions. According to Meakin et al.,  the response to position may be individualized; those with a smaller than average curvature before loading straightened under load, whereas those with a greater than average curvature before loading showed an increase in curvature under load. The literature regarding wedge angles have been limited and unfruitful. In our study, the wedge angle, lumbar lordosis, lumbosacral angle, and lumbar spine length exhibited no significant findings between the two groups. Our results suggest that lumbar alignment parameters may not be the best parameters when evaluating symptomatic patients with upright MRI. Our study had several limitations. Symptoms (back pain and radiculopathy) were grouped together due to the low volunteer sample size. Moreover, supine imaging was not obtained for direct comparison with upright imaging while symptomatic volunteers tended to be older compared to asymptomatic volunteers. Normalized foramen width at the mid-disc height and disc bulge provided evidence of foraminal stenosis in symptomatic volunteers. This was reaffirmed, as CSA was generally smaller in the symptomatic group compared to the asymptomatic group. Moreover, results support the significance of ligamentum flavum hypertrophy as a component of symptoms. The data implied that upright MRI could be a useful diagnostic option, as it can delineate pertinent differences between symptomatic volunteers and asymptomatic volunteers, especially with respect to bony foraminal geometry, disc bulge, and TLF. The authors acknowledge the considerable assistance of Judeen Richlen and Christy Stadig in recruiting and scanning the patients. This research was supported in part by the Office of Naval Research through Naval Air Warfare Center Aircraft Division Contract N00421-10-C-0049 and the Department of Veterans Affairs Medical Research. Froud R, Patterson S, Eldridge S, Seale C, Pincus T, Rajendran D, et al. A systematic review and meta-synthesis of the impact of low back pain on people's lives. BMC musculoskelet Disord 2014;15:50. Hahne AJ, Ford JJ, McMeeken JM. Conservative management of lumbar disc herniation with associated radiculopathy: A systematic review. Spine (Phila Pa 1976) 2010;35:E488-504. Splendiani A, Ferrari F, Barile A, Masciocchi C, Gallucci M. Occult neural foraminal stenosis caused by association between disc degeneration and facet joint osteoarthritis: Demonstration with dedicated upright MRI system. Radiol Med 2014;119:164-74. Balague F, Mannion AF, Pellisé F, Cedraschi C. Non-specific low back pain. Lancet 2012;379:482-91. Tarulli AW, Raynor EM. Lumbosacral radiculopathy. Neurol Clin 2007; 25:387-405. Hedberg K, Alexander LA, Cooper K, Hancock E, Ross J, Smith FW. Low back pain: An assessment using positional MRI and MDT. Man Ther 2013;18:169-71. Stemper BD, Baisden JL, Yoganandan N, Pintar FA, Paskoff GR, Shender BS. Determination of normative neck muscle morphometry using upright MRI with comparison to supine data. Aviat Space Environ Med 2010;81:878-82. Weishaupt D, Schmid MR, Zanetti M, Boos N, Romanowski B, Kissling RO, et al. Positional MR imaging of the lumbar spine: Does it demonstrate nerve root compromise not visible at conventional MR imaging? Radiology 2000;215:247-53. Zander DR, Lander PH. Positionally dependent spinal stenosis: Correlation of upright flexion-extension myelography and computed tomographic myelography. Can Assoc Radiol J 1998;49:256-61. Gilbert JW, Martin JC, Wheeler GR, Storey BB, Mick GE, Richardson GB, et al. Lumbar stenosis rates in symptomatic patients using weight-bearing and recumbent magnetic resonance imaging. J Manipulative Physiol Ther 2011;34:557-61. Iwata T, Miyamoto K, Hioki A, Ohashi M, Inoue N, Shimizu K. In vivo measurement of lumbar foramen during axial loading using a compression device and computed tomography. J Spinal Disord Tech 2013;26:E177-82. Schmid MR, Stucki G, Duewell S, Wildermuth S, Romanowski B, Hodler J. Changes in cross-sectional measurements of the spinal canal and intervertebral foramina as a function of body position: In vivo studies on an open-configuration MR system. AJR Am J Roentgenol 1999;172:1095-102. Zamani AA, Moriarty T, Hsu L, Winalski CS, Schaffer JL, Isbister H, et al. Functional MRI of the lumbar spine in erect position in a superconducting open-configuration MR system: Preliminary results. J Magn Reson Imaging 1998;8:1329-33. Shymon S, Hargens AR, Minkoff LA, Chang DG. Body posture and backpack loading: An upright magnetic resonance imaging study of the adult lumbar spine. Eur Spine J 2014;23:1407-13. Shymon SJ, Yaszay B, Dwek JR, Proudfoot JA, Donohue M, Hargens AR. Altered disc compression in children with idiopathic low back pain: An upright magnetic resonance imaging backpack study. Spine (Phila Pa 1976) 2014;39:243-8. Tarantino U, Fanucci E, Iundusi R, Celi M, Altobelli S, Gasbarra E, et al. Lumbar spine MRI in upright position for diagnosing acute and chronic low back pain: Statistical analysis of morphological changes. J Orthop Traumatol 2013;14:15-22. Gilbert JW, Martin JC, Wheeler GR, Storey BB, Mick GE, Richardson GB, et al. Lumbar disk protrusion rates of symptomatic patients using magnetic resonance imaging. J Manipulative Physiol Ther 2010;33:626-9. Zemp R, Taylor WR, Lorenzetti S. In vivo spinal posture during upright and reclined sitting in an office chair. Biomed Res Int 2013;2013:916045. Rodriguez-Soto AE, Jaworski R, Jensen A, Niederberger B, Hargens AR, Frank LR, et al. Effect of load carriage on lumbar spine kinematics. Spine (Phila Pa 1976) 2013;38:E783-91. Choi KC, Kim JS, Jung B, Lee SH. Dynamic lumbar spinal stenosis: The usefulness of axial loaded MRI in preoperative evaluation. J Korean Neurosurg Soc 2009;46:265-8. Kanno H, Endo T, Ozawa H, Koizumi Y, Morozumi N, Itoi E, et al. Axial loading during magnetic resonance imaging in patients with lumbar spinal canal stenosis: Does it reproduce the positional change of the dural sac detected by upright myelography? Spine (Phila Pa 1976) 2012;37:E985-92. Kanno H, Ozawa H, Koizumi Y, Morozumi N, Aizawa T, Kusakabe T, et al. Dynamic change of dural sac cross-sectional area in axial loaded magnetic resonance imaging correlates with the severity of clinical symptoms in patients with lumbar spinal canal stenosis. Spine (Phila Pa 1976) 2012;37:207-13. Diefenbach C, Lonner BS, Auerbach JD, Bharucha N, Dean LE. Is radiation-free diagnostic monitoring of adolescent idiopathic scoliosis feasible using upright positional magnetic resonance imaging? Spine (Phila Pa 1976) 2013;38:576-80. Gilbert JW, Wheeler GR, Kreft MP, Upadhyay SP, Storey BB, Spitalieri JR, et al. Repeat upright positional magnetic resonance imaging for diagnosis of disorders underlying chronic noncancer lumbar pain. J Manipulative Physiol Ther 2008;31:627-31. Niggemann P, Sarikaya-Seiwert S, Beyer HK, Sobottke R. Features of positional magnetic resonance imaging in tethered cord syndrome. Clin Neuroradiol 2011;21:11-5. Gilbert JW, Wheeler GR, Lingreen RA, Johnson RR. Open stand-up MRI: A new instrument for positional neuroimaging. J Spinal Disord Tech 2006;19:151-4. Jinkins JR, Dworkin JS, Damadian RV. Upright, weight-bearing, dynamic-kinetic MRI of the spine: Initial results. Eur Radiol 2005;15:1815-25. Wildermuth S, Zanetti M, Duewell S, Schmid MR, Romanowski B, Benini A, et al. Lumbar spine: Quantitative and qualitative assessment of positional (upright flexion and extension) MR imaging and myelography. Radiology 1998;207:391-8. Mauch F, Jung C, Huth J, Bauer G. Changes in the lumbar spine of athletes from supine to the true-standing position in magnetic resonance imaging. Spine (Phila Pa 1976) 2010;35:1002-7. Fujiwara A, An HS, Lim TH, Haughton VM. Morphologic changes in the lumbar intervertebral foramen due to flexion-extension, lateral bending, and axial rotation: An in vitro anatomic and biomechanical study. Spine (Phila Pa 1976) 2001;26:876-82. Dimitriadis A, Smith F, Mavrogenis AF, Pope MH, Papagelopoulos PJ, Karantanas A, et al. Effect of two sitting postures on lumbar sagittal alignment and intervertebral discs in runners. Radiol Med 2012;117:654-68. Neuschwander TB, Cutrone J, Macias BR, Cutrone S, Murthy G, Chambers H, et al. The effect of backpacks on the lumbar spine in children: A standing magnetic resonance imaging study. Spine (Phila Pa 1976) 2010;35:83-8. Madsen R, Jensen TS, Pope M, Sørensen JS, Bendix T. The effect of body position and axial load on spinal canal morphology: An MRI study of central spinal stenosis. Spine (Phila Pa 1976) 2008;33:61-7. Meakin JR, Smith FW, Gilbert FJ, Aspden RM. The effect of axial load on the sagittal plane curvature of the upright human spine in vivo. J Biomech 2008;41:2850-4. Baumgartner D, Zemp R, List R, Stoop M, Naxera J, Elsig JP, et al. The spinal curvature of three different sitting positions analysed in an open MRI scanner. ScientificWorldJournal 2012;2012:184016.